I can hardly believe it’s already time to pick a different project to work on this month. I sure hope I can do better with what’s left of my year than I have so far! I did spend some time looking for my Pineapple quilt. I was fairly certain that I knew which box it was in, but when I located the box, it was not there. In my efforts to hunt for it, however, I did get 3 more moving boxes unpacked, so I’m not calling the search a total loss. I didn’t have time to work on the Pineapple quilt, anyway! I’m moving on — it’ll turn up when I least expect it to, I’m sure. This month I’ve chosen #9 from my list, which is my Checkerboard quilt. Again, I’ll need to locate the parts I have finished. Let’s hope that leads to me doing some more unpacking! I also already know where some of the pieces are that need to be sewn, and they make great leader/enders, so I hope I can make some progress on this one. I need to make progress on something! Here’s what one of the blocks looks like. 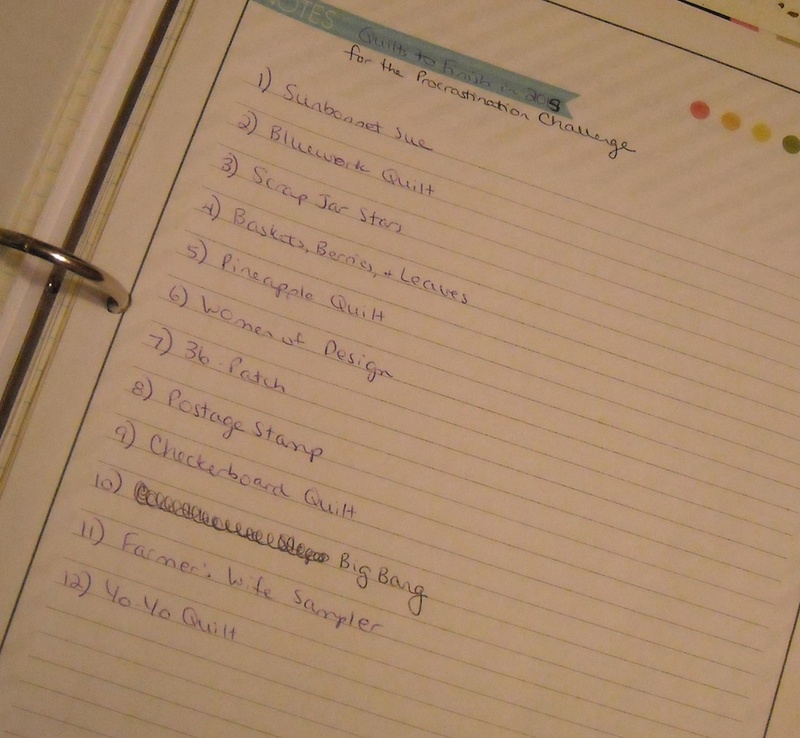 Those are 1″ finished squares. I think I need 12 or so blocks (I can’t find my plan, either) and I have no idea how many are finished! I’ll see what I can do . . .
What project are you choosing to work on this month? Good luck to us all on making some good progress during August! This counts towards organizing your UFOs correct? Do I qualify for this challenge if I don’t have that neat little list?? Actually I am not procrastinating on anything. I just can’t find my round tuit for some of the UFOs. And I get a lot of stuff done. I finished stitching the binding on the Christmas Star quilt. Whoo hoo! Well, I just bought lots of zippers at a quilter’s retirement sale. My number 9 is zippered bags. I might be able to finish them up this month. I finished up my Christmas tree wall hangings in July. That was my May procrastination challenge. So, I feel good about that. I’ve decided to work on my Hexagon baskets. I’m flying to CO for a week to stay with my son and grandson and I’m taking the blocks with me as a hand project. Hope to do some LQS there and pick up some rows. OK so I finished 2 more pages of my Quiet Book for my granddaughter from June – only 6 more to go. Plan to keep working on it – hope to give to her as a Christmas gift. August is a quilting and binding my Women of the Bible quilt that I finished the top on last year. Would love to have this finished. hi, i picked up my hand embroidered butterfly lap quilt. i have worked on it off and on going on 3 years now. still quite a bit to do but, i can see that it is doable now. the butterflies are done except for the outlines and the outsides, still lots of green leaves to do and all the names to do. but i would so love to be able to use it. I like how honest you are about your process. I thought I was the only person who “lost” a quilt for a year! When Thanksgivivg came along and I cleared a little-used table, voila! there it was. Just in time to finish for their anniversary. I got a row by row experience done. I am back working on a charm quilt. Thanks for much for quilting the quilt they raffled on at the Wien Picnic. I’m afraid I didn’t make any progress on my UFO either, other than picking out a backing for it. I think I am more of a piecer than a quilter, as I get stumped on the actual quilting part. For this month, I’ll chose the same as you, my #9, which still has blocks to piece, so maybe I’ll get more done! 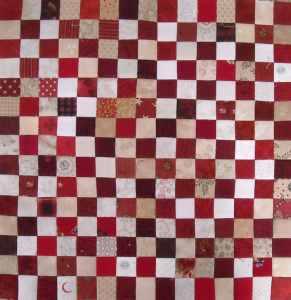 This is one of my favorite quilts that I’ve seen on your blog and I’m glad that it has reappeared. Something about a two color quilt and little tiny finished squares. If you don’t finish it, no problem. I will enjoy seeing it surface again in the future. I don’t even want to talk about my UFOs. I am starting more quilts than finishing these days and my sewing room is still stacked in boxes without a machine set up since we moved back to our house after our remodel was completed (sort of) at the end of July.